Alexander Thomas is a Postgraduate from University College, Durham University (UK), where he obtained a distinction both for his dissertation and for his Master of Arts degree. He has worked for several international energy think tanks specializing in the energy security. 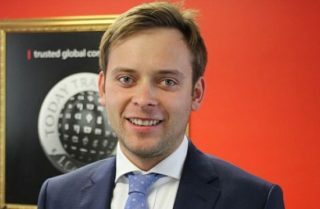 Currently, Alexander works in the financial sector, manages a London based organization and is an Associate Member of the Energy Institute in London. He has carried out extensive research on the Energy Security implications to Croatia of the South Stream pipeline – which focused on the EU’s diversification of natural gas routes and resources; and the Geopolitics of the East Mediterranean gas upstream and its impact on the European Union energy security. The second detailed research piece was supported by BP and used by The Economist, the Durham Energy Institute and the European Commission. He has also written about the development of the Southern Gas Corridor and the selection of TAP to transit the Shah Deniz gas to Europe, the challenges with the Trans Anatolian Pipeline (TANAP) and the South Caucasus Pipeline (SCP).